Birkeland, Peter W.and Edwin E. Larson. 1989. 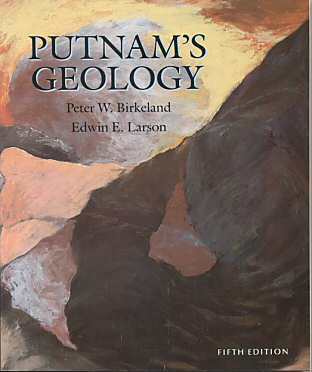 Putnam's Geology. Oxford University Press, New York. Paperback 646 pages. I haven't read this one yet although I frequently consult it as a reference. Professor Putnam died in 1963 and it is a testament to his original effort that after forty years and five editions this completely updated text still bears his name. I like it's simple, direct style aimed at a general college level audience. The text is clearly written, there are plenty of excellent quality black and white photographs on nearly every page and single color diagrams, charts and line drawings. A readable, authoritative text.